Nowbox App Enhances YouTube Experience On iPad – Download Now! A newly released iPad app promises to change the way we watch not just YouTube video content, but much of the online video content that we now consume on a daily basis. Nowbox first came to prominence last year when it was a YCombinator company, and funding from the likes of Ashton Kutcher has seen the business move forward, culminating in the recent release of the Nowbox iPad app, which is available now for FREE on the Apple App Store. What Nowbox aims to do is leverage the iPad’s place as a media consumption device by bringing users a new way of watching online video. Instead of YouTube fans watching their subscribed channels in a web browser or the poor iOS app, they can now use Nowbox’s swanky iPad app. Where Nowbox excels is the fact that users can also subscribe to other non-YouTube content, with the app grouping various feeds into categories such as tech, entertainment and comedy. Once subscribed to these new channels, users will then be presented with a DVR-type interface, giving the illusion that content is acting like a television set top box. 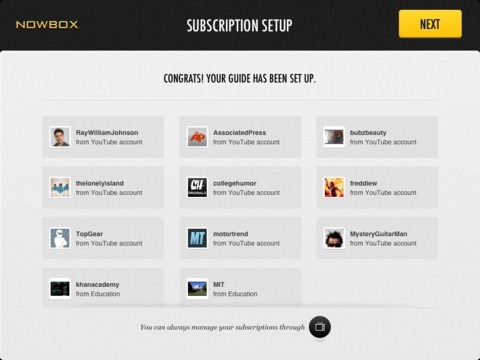 NOWBOX is your personalized TV guide to the best of YouTube videos through your iPad. 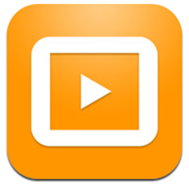 Connect your iPad through AirPlay and turn your NOWBOX into a continuous video viewing experience on your TV. Subscribe to a multitude of channels and scroll through the channels. Just like a TV guide, except it’s personalized and organized according to your favorite channels. This is an interesting take on the online video idea which we find ourselves a little baffled by. Surely the whole point of online, on demand streaming video is that we can get away from the idea of having content come to us in a linear fashion. Yes, Nowbox does let you choose what to watch, and you can skip video and select pretty much anything in the stream, but the whole interface reeks of a bygone era. Perhaps we just don’t ‘get it’ but Nowbox just hasn’t really clicked for us yet. It is early days for Nowbox right now, and we will certainly give it the benefit of the doubt while we test it further. For the price of FREE there isn’t really a good reason not to at least give Nowbox a try, either.